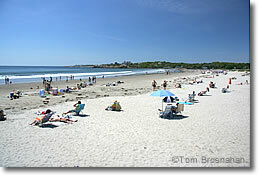 Gloucester's favorite beach is only a few miles from the center of Gloucester. Some inns, B&Bs, small hotels and motels overlook its pretty sweep of sand and dramatic rock outcrops. Gloucester's Good Harbor Beach is well named. Guarded by islands that protect it somewhat from the open sea, it's a broad band of sand backed by salt marsh, with dramatic rock outcrops at either end. It's within walking distance of some neighborhoods of East Gloucester, a fact that the neighborhood's inns, B&Bs and small motels announce with pride to their guests. The parking lot, reached via MA Route 127A, fills early on hot summer days. The alternative to reach the beach is the CATA public bus. Don't even try to find a parking place on nearby streets. Fierce "No Parking!" signs warn you that your car will be ticketed at best, towed at worst. Good Harbor Beach from the northeast. 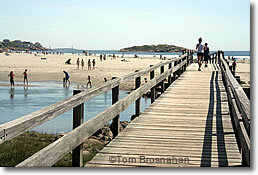 Above, footbridge to Good Harbor Beach, Gloucester MA.